How do pesticides kill bugs? If you've ever wondered about this question, and want to make sure the pesticides you use don't adversely affect your family, read on! Just How do Pesticides Kill Bugs? Most pesticides work by affecting the nervous system of the insect. The pesticide interrupts the information being sent by neurotransmitters in the synapses. The chemical produced by the body used to send information through the synapses is called acetycholine. An enzyme called cholinesterase binds with acetycholine and allows muscles to rest. In a body that is working normally, the acetycholine sends messages to the muscles through the synapses. Cholinesterase keeps the amount of acetycholine at an acceptable level, which controls the stimulation. When a pesticide is introduced at a lethal dosage for a particular body, the cholinesterase is affected, keeping it from binding with the acetycholine. When this happens, the muscles are over-stimulated which will lead to paralysis and death. The effect of organophosphates was discovered in the 1930's during World War II. They were used in the creation of nerve gas, which was used in chemical warfare. When used in lethal dosages for humans, organophosphates cause extreme excitability, convulsions, paralysis and in most cases, death. Both individuals and exterminators use these pesticides. The products can be easily found at your local gardening center. Because of the lethal aspects of this class of pesticides, it is recommended that pets and children be kept off of lawns and out of gardens when they have been applied. N-methyl carbamates are another class of pesticides commonly used in the home and garden. Like organophosphates, they inhibit the cholinesterase from binding with the acetycholine in the body. The results are the same; insects become paralyzed and die. Pesticides manufactured and sold within the United States include information on the proper use of pesticides and safety precautions. Pesticides used improperly can expose the handler to toxic levels, which can cause illness and even death. Basic safety precautions should always be observed when using any pesticide. Wear gloves when handling pesticides to protect your hands from absorbing the chemicals. Wear a mask when spraying any pesticide to slow down the inhalation of the particles in the air. Leave the area promptly after spraying any pesticides, especially if they are being used in the home. Air out your home before family members resume living in areas treated by the pesticide. After applying pesticides, take off clothing used in the process and wash them before wearing them again. Fatal Funnel - Provide your own two liter bottle; insert the Fatal Funnel into the side of the bottle. Add fruit juice and put the cap on the bottle. 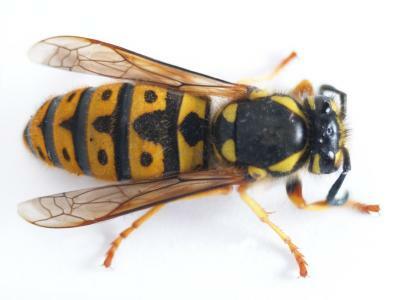 Place in an area where wasps, hornets and yellow jackets cause problems. Bugs 'R Done- This product is made with orange peel oil, which is safe to use around pets, children and food. The pleasant scent is preferable to commercial pesticides. Kills roaches, flies, wasps, spiders and ants. Mosquito Repelling Granules- Both non-poisonous and biodegradable so they are safe to use around the home. Sprinkle around the perimeter of your garden and yard to safely repel mosquitoes. Uses lemon, peppermint and garlic oils. DynaTrap- Kills flies, beetles, hornets, wasps and yellow jackets. This plug in bug zapper controls flying pests a half-acre area. Two small lights attract pests then they are sucked into a funnel and dehydrated by a vacuum fan. Solar Mosquito Zapper- works in the same way an electric bug zapper does, but without the use of electricity. Position in any area where insect pests are bothersome: from the garden to the patio. Now that you know the answer to the question: "how do pesticides kill bugs", choose your weapon against them wisely. Chemical pesticides may be quicker, but they have an adverse effect on the environment, pets and small children.